"Hallowed Be Thy Name" begins the famous words of the Lord Jesus Christ from the Gospels. 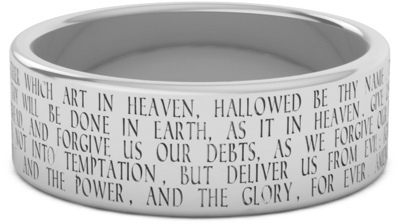 The entire prayer is etched onto the front of this 14k white gold ring from the Authorized King James Version of the Bible. Available exclusively from Apples of Gold jewelry. Band is available in 7mm (shown) or 8mm width in both men's and women's ring sizes. Also available in yellow gold or sterling silver (shown below). "Our Father which art in heaven, Hallowed be thy name. Thy kingdom come. Thy will be done in earth, as it is in heaven. Give us this day our daily bread. And forgive us our debts, as we forgive our debtors. And lead us not into temptation, but deliver us from evil: For thine is the kingdom, and the power, and the glory, for ever. Amen." Please note: there may be a small space/break on back of ring where the verses go from one line to the next. Each ring is carefully engraved with the utmost thought given to spacing and design. We guarantee our The Lord's Prayer "Hallowed Be Thy Name" Ring in 14K White Gold to be high quality, authentic jewelry, as described above.